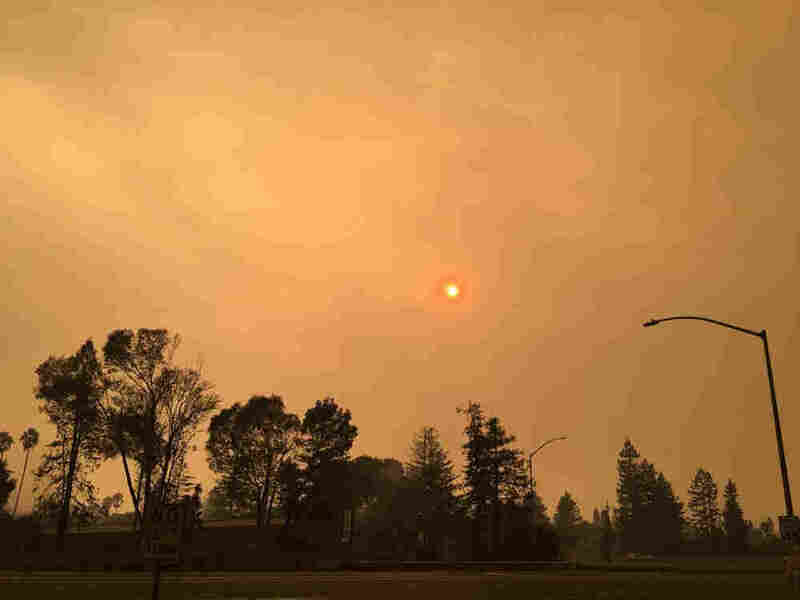 Wildfire Smoke Has Made Bay Area Air Quality Its Worst On Record : Shots - Health News As wildfires spread through Northern California counties, clouds of smoke and ash are spreading, too, far beyond the flames. Air quality officials have a database that's searchable by ZIP code. The sky over Santa Rosa, Calif., on Monday. Air pollution in counties of the San Francisco Bay Area this week has been the worst since 1999 when officials began collecting data. "The pollution is so high it's comparable to high pollution days in China," says Lisa Fasano at the Bay Area Air Quality Management District. 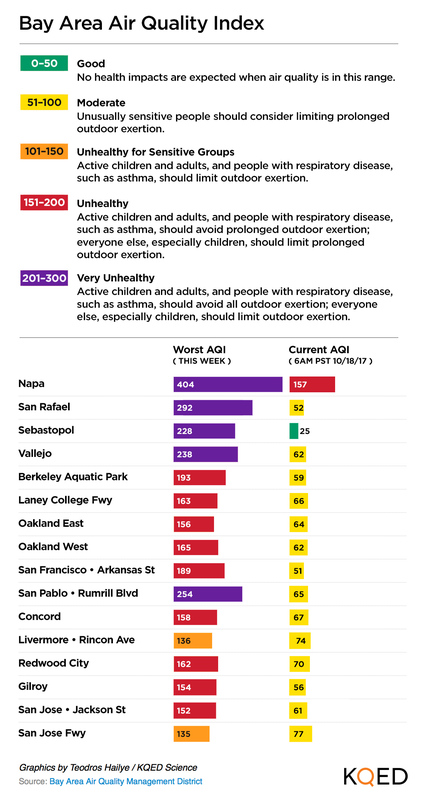 The worst hour so far was measured on Tuesday in Napa, Calif., with an Air Quality Index of 404 for small particulate matter — so high it's off the chart, as you can see below. Officials warn that very fine smoke particles, a fraction of the size of a human hair, can lodge in the lungs and, particularly in some vulnerable populations, do damage. "When we breathe particulates, they bypass the lung system and get into our bloodstream," says Fasano. "They exacerbate respiratory conditions like asthma, [chronic obstructive pulmonary disease], emphysema and other conditions, because they are very harmful." A seasonal inversion layer is putting a lid on the pollution and holding it in the region. Usually the Bay Area benefits from a natural air conditioning system with winds blowing in off the coast and carrying the air inland. Residents in the North Bay are experiencing the brunt of the pollution because of nearby wildfires in California's wine country. Residents in Napa, Solano and Sonoma counties should try to stay inside buildings with air conditioning. But people in the East Bay and South Bay are not completely in the clear because the toxic air is creeping all over the region. You can look up your ZIP code here and find a five-day forecast here. "We are also seeing elevated levels in San Francisco and Redwood City," says Fasano. "We are all being impacted by this really unhealthy air pollution." Fasano recommends buying a face mask at the hardware store with an N-95 rating or higher. Unfortunately neither a hospital mask nor a bandanna tied over the face prevents noxious air from entering the lungs, and to make much of a difference, even N-95 masks must fit well. Fasano suggests staying inside as much as possible while skies are smoky to avoid breathing both particle pollution and ash wafting through the air. Consider, in some cases, leaving the region until air quality improves. This post is based on a story by KQED that is being periodically updated with the most recent air quality numbers.